The work for the new daggerboards [Moonwave – New Daggerboards] and the new Torqeedo Saildrives [Moonwave – Deep Blue Hybrid System] required structural carbon work on the hulls, with lots of carbon dust… As electrical and electronics equipment don’t like carbon dust at all, all the equipment got removed beforehand. 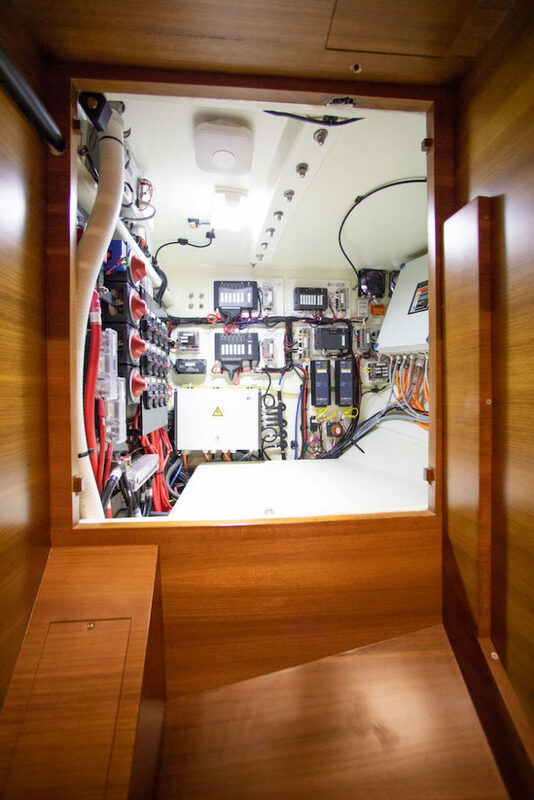 Once finished with the dusty jobs, we reinstalled the electrical equipment back on board with brand new and neat wiring and most of the electronics got upgraded [Moonwave – Electronics Upgrades]. Recently we have been asked a lot of questions regarding our electrical installation. As we have almost all our equipment electric from propulsion to cooking – this seams complicated from far but it’s not at all. All the high voltage equipment and wiring [we are talking 380V DC] is handled by Torqeedo and their specially trained engineers took care of this. 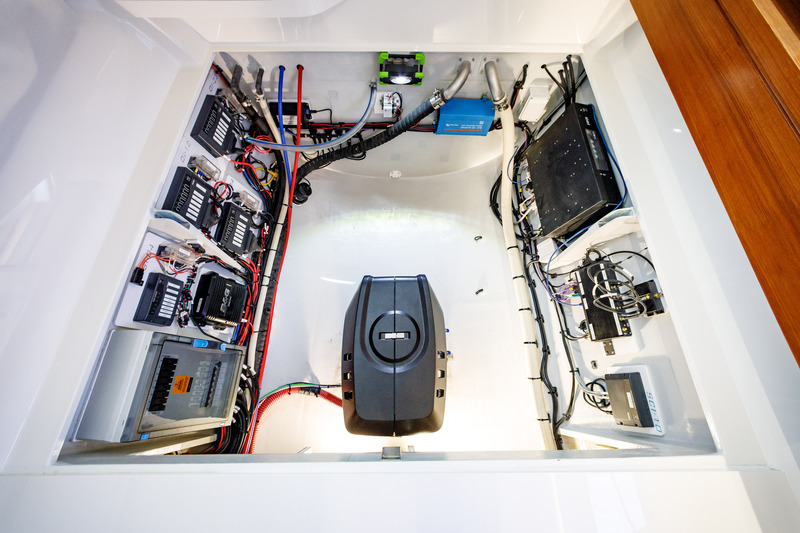 The whole Torqeedo installation is independent from the rest of the boats electrical installation and in general the Deep Blue Hybrid System can been seen as the “Power production and storage manager” for either 24V DC or 220V AC [European Standard]. The Torqeedo Deep Blue Hybrid System has several power sources – solar power [Moonwave – Solar Panels] that can charge the 24V house bank and the HV [high voltage battery], the shore power chargers, the generator or the electric engines in regeneration mode can also charge the HV [High voltage] battery. The HV and LV [Low Voltage – 24V] battery bank can charge each others via bi-directional converters as well. But that’s all handled by the software of the Deep Blue Hybrid System that keeps the batteries in good shape and charged up and we don’t really have to interact with the different components. All the rest of the equipment is handles through CZone – a marine digital switching and control system – we hear a lot of negatives feedback or reluctance towards those systems and we do not understand why. This is a bit the reason of this article, oppose a voice that says something different because it’s working really well for us and we love it. In a house or with a traditional electrical installation on boats – all the cables come to one breaker panel – the breakers or fuses are there to protect the equipment and cables. On board a catamaran like Moonwave with equipment placed in both hulls from the bows to transoms, this would represent a lot of cabling to return to one central place in the boat. Somehow this sound counter effective on a performance cat where it is crucial to save weight and space [wiring can take up quit some volume]. And I hear also the cruiser’s comments “why is this always about performance boats”? 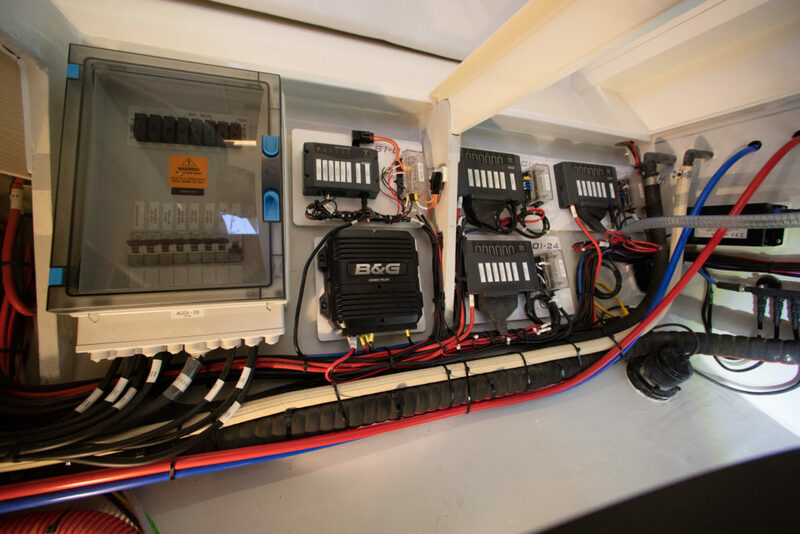 And this is correct cruising boats will also benefit from such an install as the installation gets very much simplified. The way it works for us is we have small “Czone Modules” spread out in strategic locations within the boat to power the different equipment. 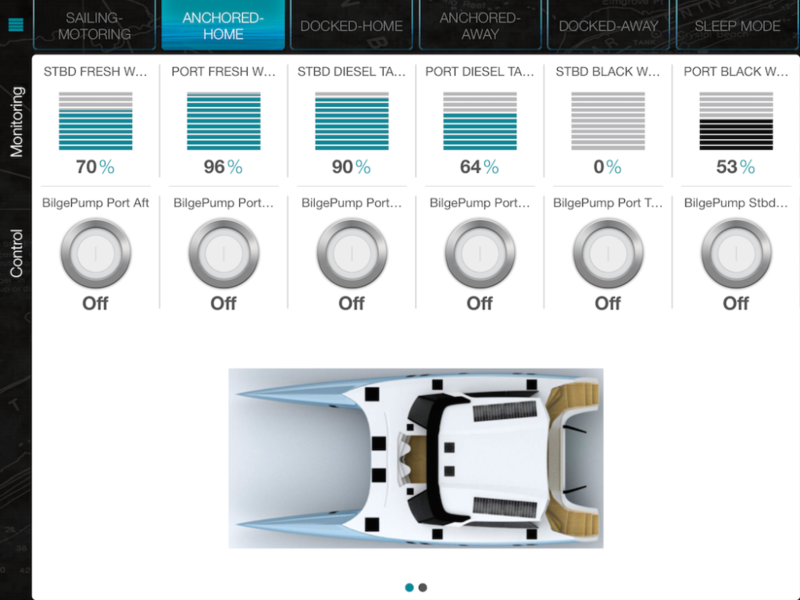 Like that we only have one big set of cable (pos and neg) run from the tech space to provide power to the modules and than the modules provide the equipment – like a tree, big branches to six areas in the boat [Port FWD, Port AFT, Stbd FWD, Stbd AFT, Bridgedeck, Helm & Nav Station]. As the actual cables from each equipment to the closest module are as short as possible and easy to identify, this actually saves a lot of weight in copper and time in case of troubleshooting. 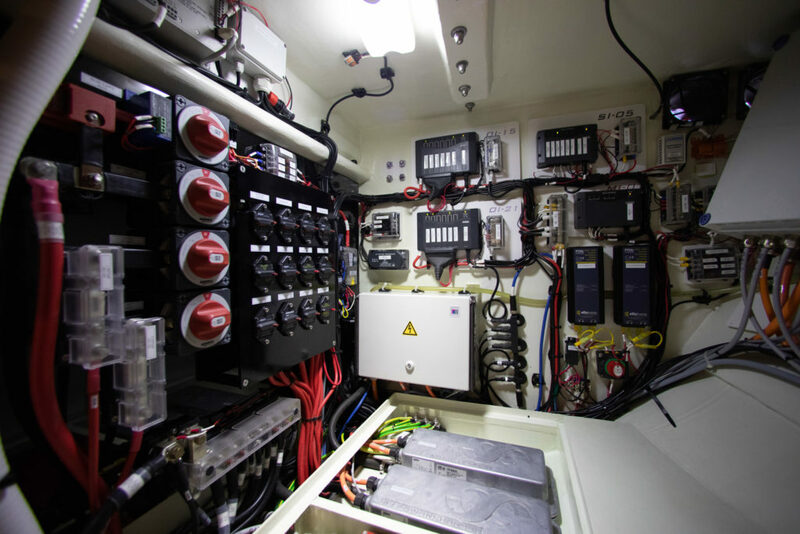 There are different types of Czone modules for either powering equipment, receiving signals (tanks sensors for example) and switching (programmable light switches), metering (battery voltage for example) and all the modules communicate with each other – I guess that’s why they call it a Bus system. 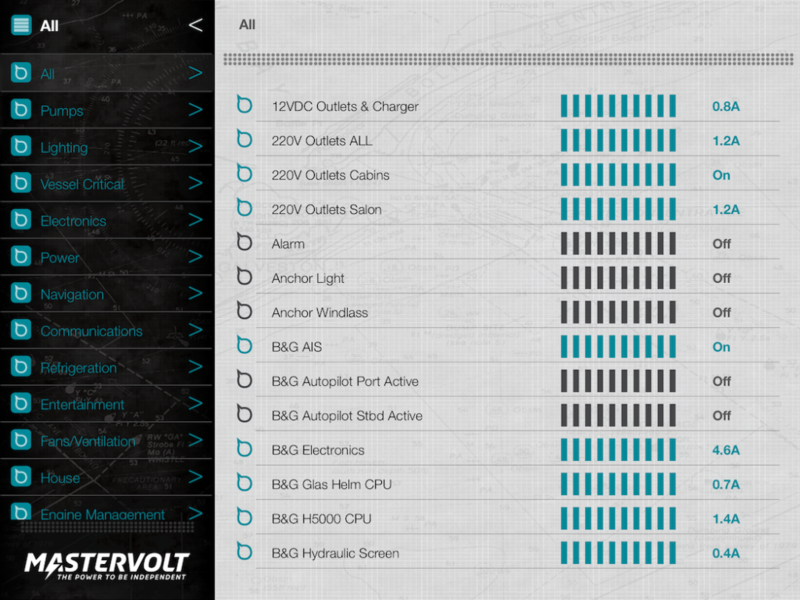 All the data [current draw, voltages, etc.] of each equipment and interaction with them [status, on/off] can be either controlled and monitored via a dedicated touch screen or through an app on the iPad. This can be very “handy” when laying in bed and double-checking that all the lights are off or pumps are on/off without getting up. 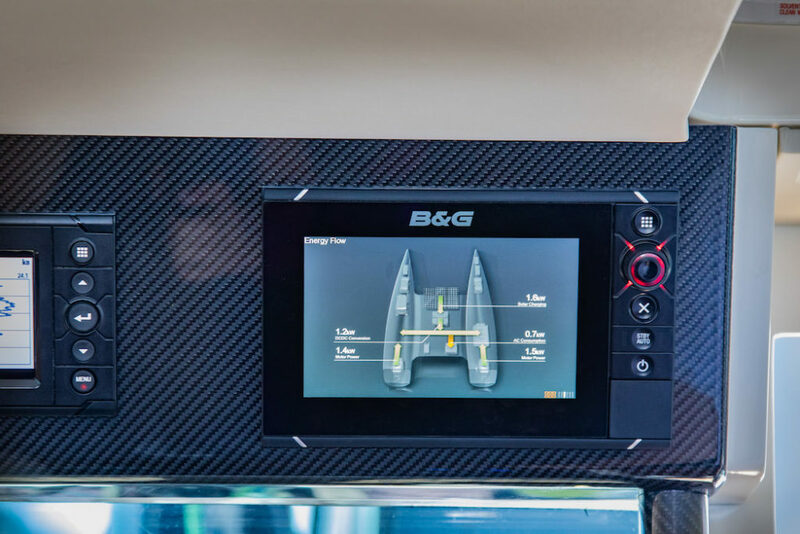 For safety reasons, the automatic function of the bilge pumps is directly powered on a separate circuit [if Czone is ever down] but the bilge pumps can be manually turned on/off via the touch screen or app. We are using the same Czone modules since first launch and to be honest it was a disaster when first installed. Like lots of things it comes down to proper install and planning. The team that first installed and designed didn’t think in how to “geographically’ plan and install neither the modules nor the actual equipment in a optimized manner so we ended it with lots of unnecessary cables, damaged cables, alarms going off a lot and unreliable equipment. We fixed this already a couple of years ago and now with the latest refit we optimized again cable runs and placement of modules and equipments. And we are really happy with the installation. At a first thought, one thing professional electricians will not like me to say is that you are saving a lot of money in man hours as running cabling is extremely time consuming. But at a second thought electricians should appreciate the benefit of such a setup as the difficult part of their job is also to lay cables and with a bus installation you increase the making connection vs laying cable ratio. And it seams to us that the one thing most electricians seem to love, is sitting around with lots of crimping tools, fittings… all the bells and whistles an electrician can carry and make connections all day long. It takes a bit of time to get your head around the “philosophy” of the whole “bus system” but once properly installed and set up – it makes life on board a lot easier and also electricity efficient as it’s so easy to turn things on and off and check in real time the consumptions and status. This type of installation also opens lots of options for further functions like “buddying” equipment – we have one button to turn all the electronics on board on or off [but each equipment can also be individually controlled]. 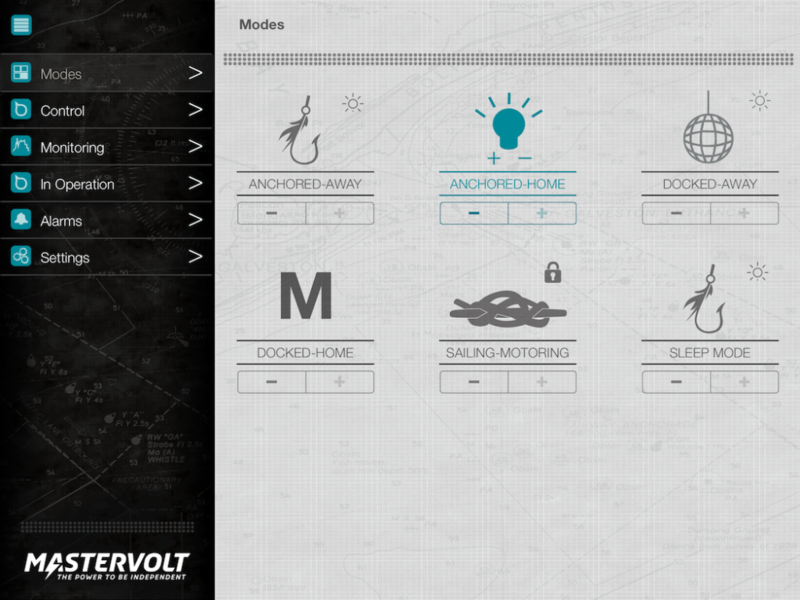 When leaving the dock we switch from “Docked” Mode to “Sailing/Motoring” and all the necessary equipment turns on.